I began playing Farmville to get a feel for a gathering-based game. 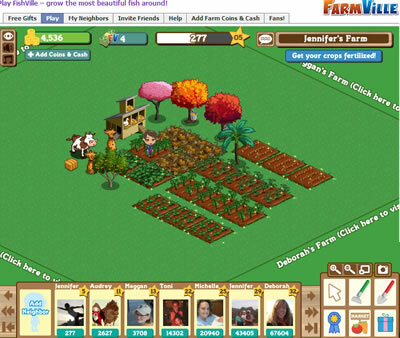 When I realized that this and other games use the Free to Play, Play for a Fee approach, I decided that my goal would be to play Farmville and note how successful I could be without spending any real money. 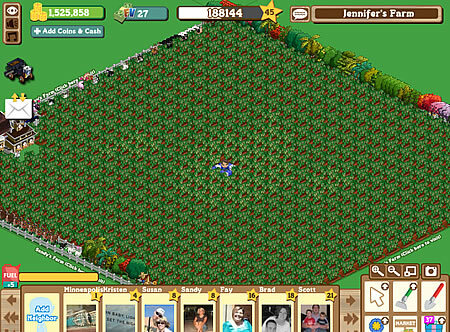 I am happy to report (and much to Zynga’s dismay I’m sure) that I am now a level 45 farmer and have not spent a single cent of real cash! My motivation to play this game was when I saw that one of my friends who I played World of Warcraft with was already at Level 51 when I started. I saw her farm and was impressed. She had a lot of work and time in. I referred to her farm and other high-level farms to learn how to make my own farm. There were very little instructions provided at first, and if it wasn’t for the fact that I forced myself to play this game and also liked the graphics, I would have bailed pretty quick. I couldn’t figure out how to plant more than 6 crops (what they start you off with). I had seen that all of my other FB friends who play had many farm plots. I finally figured it out by accident when I clicked my plow tool randomly on the grass and it planted a plot. I began to figure things out soon enough though and eventually started to build my farm. I learned from watching my friend’s farm and from her status updates to plant 1 type of crop repeatedly so that I could master the crop. My motivation to become a master of a crop was to see what happened or what I gained when I did so. I earned a sign to place on my farm if I chose and take up space. Thanks Farmville! I also learned quickly that I couldn’t let my crops sit around once they were ready for harvesting. I had to start noting the time that I planted and how long a crop took to grow so that my efforts wouldn’t be wasted. At Thanksgiving Farmville introduced the holiday tree and the ability to send presents back and forth. The holiday tree was a container that held 100 presents. On Dec 24, the presents unlock and are able to be opened to see what they hold. On Dec. 24 I had 100 presents. I also got my significant other to play to help me get more presents. He and I became present-crazy. It was literally just like Christmas as each present was an unknown. During this time I also learned the importance of my Farmville friends posting updates to the Newsfeed so that I could gain items. The one thing I found most annoying was suddenly a new motivation for me. I continued to play into 2010. None of my friends believed me when I said I was playing for research. My holiday tree still worked, gifts were being sent, and I was leveling. I was also in a self-imposed competition with a few friends to level past them. I was a super farmer – and then I ran out of all my free fuel. In order to quickly plant crops, harvest crops, plow harvested land it is best to use the farm machines so that all of these processes can be done at 4 plots at a time. Fuel is required to use machines which Farmville will happily sell for real money. I had gotten so spoiled with all of the free fuel I had received that I started to become disenchanted with the game. My farm had grown considerably and it just took too long to harvest daily. Suddenly Zynga began pumping out the Farmville updates. I believe their business model for 2010 is to pump out as many Farmville updates as possible while making sure that the game stays stable. There were collections, harvesting from chicken coops, gear to commemorate the upcoming SuperBowl … it had just become manageable when I left for vacation on January 30 for an 8 day cruise – with no internet. It was at this point that my game play peaked. After I returned, I was overwhelmed by new items, new updates, friend’s gifts and I began to lose enjoyment for playing. All of the things that had motivated me originally had now become overwhelming. Farmville had become a job. An interesting side-note occurred when more and more friends started completing collections. I realized that I could start collecting free fuel again each time I had completed a collection. My motivation returned – slightly – as completing collections was not an easy task. One day a friend started sending me links to completed collections that their other FB Farmville friends had made. Suddenly my collections were becoming completed and my fuel had increased. I’m not sure if Zynga knows that this technique to helping out each other complete collections faster exists. It’s probably a bug, but it helps us all in the meantime. I’ve really lost my desire to continue playing. I like checking in on my awards to see how much further I need until my next ribbon, and I like working on my collections. Mostly though, the game has lost it’s luster with me. It feels like a job. I’ve taken on the lazy approach to getting a better harvester to harvest 9 crops at a time. I’ll talk more about this in the Mafia Wars blog. Next week’s Social Games Summit at GDC may or may not rekindle my desire to continue playing. Zynga is one of the speakers and it will be interesting to hear their side.